The Sneak Attack! Has Your Phone Stopped Ringing? The SNEAK ATTACK can happen so slowly; you do not even realize it is happening until it might be too late. The slow, quiet sneak attack; can happen to anyone in business. And, it happens very slowly; that is why I call it the SNEAK ATTACK! What is the Sneak Attack? It can seem like it happened over night; one day you were the most popular Salon in town, and the next day you are wondering why your phone isn't ringing. The worst thing to happen to any business would be to be forgotten: NOT the economy! You need to stay AWARE! There are opportunities every day for your business to be forgotten: by existing clients, potential clients and surrounding businesses. But there are more opportunities everyday to remind existing clients, potential clients and surrounding businesses, that you are still here, and you are here to stay!!! There are many things you can start doing today, to help people remember you. The most important is to make a brochure; and Pass out 20 Brochures a week to potential clients. You need to have a written brochure, that you pass out to everyone you come in contact with, and every one of your clients need a couple extra in their purse to hand out. What to put on your brochure? Focus on the question that every Client wants to know: What's in it for me? At the end of the day, every Client is looking for more value for their money. The answer to this question must be one of the first things your clients see when reading your brochure. Communications: If your client’s are going to remember you, you must first answer the question: "What's in it for them?" List everything your client receives from you and your services. What makes you, your services and your products, different from everyone else? There are a lot of Nail Salons, and for every product or service you provide; chances are very good that someone, somewhere else, does almost exactly what you do. Being UNIQUE:Then the question becomes: NOT “WHAT do you do?”, BUT: “HOW you do it”.In other words, what makes you unique? 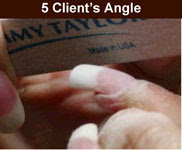 What can a client get from you that they cannot get from anyone else? from anyone else; and market that point. Note: Do not use the words “quality” and “service” as your selling point. Quality and Service is of course very important, and you have to have them to be successful; but these words have been over used and abused, so much so, they do not give enough impact when marketing yourself.Clients EXPECT quality and service; as they should. no one else can do as good as you. CONCENTRATE on what you are good at, and build on that first. Set aside a few hours this week to brainstorm, with someone whose opinion you respect; and they know you and your business. Come up with a list of everything you offer. Then make a list of everything you offer, that others in your area do not offer; or that others are not as good at, as you are. Do some research, to find out how other Salons and Nail Techs in your area are differentiating, or promoting their services and/or products? All of your communication must be emotionally impactful. Anyone can quote statistics, but the most effective way to ensure an mpact on future potential clients, or your existing clients, is to communicate with them on an emotional level. You must find out what aggravates them, and then YOU must come up with a solution; how can you make it better. What is it about their nails; that causes them aggravation? Do their nails hurt after getting them done? Do they feel like their nail questions are not getting answered? 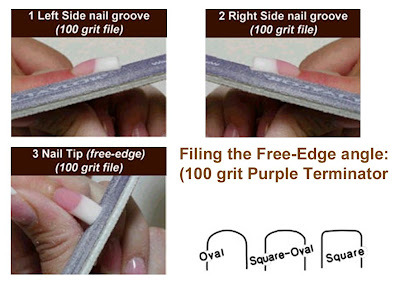 Do their nails split and crack? Do they break a lot of nails? Are they afraid of getting fungus? Are they afraid of not having proper sanitation and disinfection? Are they having a hard time getting in for an appointment? Are their nails beautiful; and do they get compliments? Here are a few ideas of what else you might want to put on your brochure, so you reduce their risk and they feel totally secure having you do their nails. Do you offer a written guarantee? Especially 2-week standings! Do you offer a free trial nail? Testimonials: from your existing clients? Find their “Aggravation” and “Communicate” with them on an emotional level, about how you can help relieve all of their aggravation, and make getting their nails done a pleasurable experience; and they will come back every 2 weeks, for the next 20 years. Pass out 20 brochures a week, and Let EVERYONE know you are still here, and you are here to stay!!! And you will not be forgotten!! !